A bath board is a wooden or plastic board that creates a seat across your bath so you can sit to have a shower. It is held in place with cleats that grip the insides of the bath. become short of breath and tired when you stand to have a shower. If you use a bath board to shower, it is best to also use a hand-held shower fitting and have a non-slip mat and handrails. What sort of bath board should I get? Bath boards come in different shapes, sizes, and types of materials. They also have different weight (loading) limits depending on what they are made of. The type of bath board you get will depend on your bath style, your weight and the measurements of your bath. To fit a bath board, your bath must have a ledge at least 2 cm wide on both sides. If your bath doesn't have a ledge, talk to an occupational therapist about your options. Before you choose a bath board, measure the width of your bath from one outside edge to the other outside edge. If there is a rim around the edge of the bath, measure just inside the rim. You will need a bath board that is about as long as this measurement. the bath board sticks out over the edge of the bath – this is unstable and can tip. 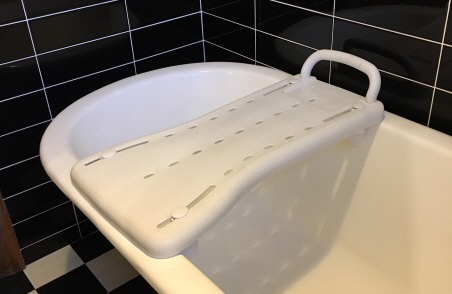 If you are unsure about using or fitting your bath board, or whether a bath board is right for you, talk to an occupational therapist about your options. How do I use a bath board? Always make sure the bath board is fitted snugly according to the manufacturer's instructions and does not move around. Check the fitting regularly. shuffle across to the middle of the bath board. To get out of the bath you reverse the process. Once your legs are outside the bath, bring your bottom forward as close to the edge as you can, and use your hands to push up off the edge of the bath into a standing position. If you have recently had surgery, especially hip replacement, or a knee injury, talk to an occupational therapist about how to use the bath board. You will need to use different techniques to protect your surgery site and make sure you don't injure yourself. How do I clean and maintain a bath board? You will need to clean your bath board regularly to make sure it doesn't get slippery, but don't use abrasive cleaners. Wipe the surface of the board dry after each use. This includes cleaning underneath, as well as cleaning the cleats that hold the board in place. Check the board's condition, and how well it is fitting, at least once a week. If it becomes wobbly and loose or shows signs of wear and tear, remove the board and do not use it. Talk to an occupational therapist about what you should do.